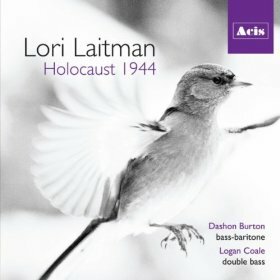 "Lori Laitman's Holocaust 1944 is a song cycle for baritone and double bass. The poems were chosen from the book Holocaust Poetry, edited by Hilda Schiff. The Holocaust was the defining moment in the lives of these five writers, and their poetry allows us to identify with their collective experience, making the horror of these years seem more immediate and real. Their words teach the lesson of the Holocaust to a new generation, heroically declaring, Never again."